I’ve been adding a few bots to OGS that play closer to the beginner level (one targetting 20k, one targetting 12k). But I’m not sure which levels would be most useful to support new players as a supplement to playing human-to-human games. My main worry is that the 20k bot might still be a bit too strong and frustrating to complete beginners. Is it too much to expect new players to request for a handicap? Maybe “Automatic” handicap should be the default (IDK know if it s)? But to me (and this is based on nothing more than my feelings) having a bot that plays complete garbage has little value and I would not really go below the 20k. I’d just say let beginners play LZ / ELF and simply choose tangible goals. Have >20 pts of territory at the end of the game. Have >30 pts of territory at the end of the game. Better than playing a bot “that plays […] garbage”. I wouldn’t go below GnuGo, which is bad enough a bot to be exploitable. Thing is that LZ / ELF don’t play unreasonable, so getting ~ 50 points is not so difficult if you just concentrate all your moves on 1/4 of the board. Tested it: Yup, LZ just leaves you alone doing your thing. I was thinking something like this earlier as well, a bot that chooses a fixed strategy (always try to capture the first stone / group on the board; always respond locally; always tenuki about 2 moves too early; always play small moves close to your strength; etc) and puts some hints in the chat if the other player is getting behind. I’m no programmer, but I think it should be possible to modify LZ for this (e.g. limit its search by only letting it evaluate the next move on smaller parts of the board). That way you also have a good estimator “watching” over the bots shoulder. So? At some point everyone will fail, and that’s when you will have to work hard to get +x points. You’re just at step n out of N until you’ve reached the point of parity. Yes, but I bet that there will be a pretty small margin between getting +x points and getting +x+10 points, roughly around where LZ starts to feel threatened. +x being doable by practically everyone, +x+10 needing dan-level play, +x+20 being impossible for humans. Anyway, the point is to not play weak bots. If you can come up with a better metric (score difference <X, make n moyo invasions live,…), be my guest. The side effect is that if you’re watching your LZ opponent, you’ll see good strategic decisions and good moves. If you’re watching IdiotBot, you’ll pick up terrible strategic decisions and terrible moves. If you must, use IdiotBot as a benchmark (1 out of 100 bot games), NOT as a practice partner (100 out of 100 bot games). Thank you for helping beginners! New players don’t understand what handicap is, probably. So better not to confuse them. Maybe for a beginner 25k-24k bot is good, because winning against it makes them 24k. There are players who struggle to get out of 25ks. I personally played my first game against random bot. I completely disagree with @smurph. His ideas are maybe ok if we have a new player committed to learning go. But that’s not how real life works. In real life newbies just read the rules of the game and go to a first google-suggested server to play. Since they aren’t sure how to play yet, they choose to play against weak bot first. And that’s why we need bots that play garbage. So new people wanting to play can play and win some games, and bots are ideal targets. They don’t get frustrated with new players, they don’t cheat (purposefully, at least). If you want to make beginners do exercises so much, how about just forcing them do 1000 tsumegos before they can play ? I agree that this is the way to go for players who have some idea what they are doing, but if you’re still learning how to connect groups, play atari, what eyes are, etc. then it doesn’t really matter that your opponent has excellent tactics. If you don’t care about what these bot-players will learn from the games which they’ll have to un-learn later on,… the goldilocks zone for computer-assisted training is 75% winrate. Therefore, pick your target group and do the math. 75% winrate indicates a little more than 1 stone difference. Choose a bot that performs at, say, 22k level if you’re aiming to let 20k players play. Call it BeginnerBot20k, make all games unrated and there ya go. The bot will lose most of the time and make lots of players worse at the game, but perhaps more invested (citation needed). 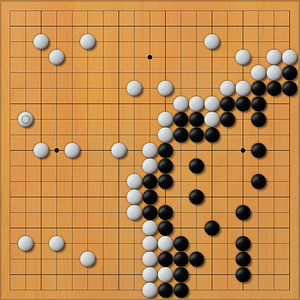 The side effect is that if you’re watching your LZ opponent, you’ll see good strategic decisions and good moves. If you’re watching IdiotBot, you’ll pick up terrible strategic decisions and terrible moves. By your logic no human player should ever play another human player because they’re just going to pick up terrible human moves and then un-learn it. For example, lots of human players still play old 3-3 invasion joseki, lots of DDK player don’t play joseki at all. So no beginner should ever play against player of their level? This would be the perfect argument for advising player not to play other humans of roughly the same level: they might pick up some abominable strategies from that. I remember playing whack-a-mole with a bot or two that played more or less randomly on KGS when I first started. Getting to where you can perform no worse than literally random stone placement is actually something of an achievement for new players. Considering how many people are so terrified of playing against other people around 24k, 22k, 20k, 18k… maybe having bots that perform at roughly those steps has some merit just to keep some slack in the line until they feel more comfortable playing non-bots. Maybe someone has access to site stats with enough info to note at what level people tend to self-select out of the game. I come and go at around 20k, but I also don’t care for playing bots, so I’m not in the target demographic on multiple levels. Not at all. Human vs human games may be bad if your goal is to improve your strategy/tactics, but they’re very useful to explore psychological aspects of the game - or to have a chat, etc. Bots don’t have a psyche to explore, just habits to exploit. But yes, I would advise new players to avoid “practicing” with players of their level. There’s nothing wrong with casual games, but if your goal is to improve, play stronger players or strong bots. Who are we to decide what / who a new player should play against? Why not just give people weak bots and let the ones who are aiming to improve decide to walk a path with only strong opponents. There’s clearly people who want weak bots, so let’s give them what they want. and “W[hat] D[o] Y[ou] T[hink]?”. I think it’s not useful at all to have weak bots “[in addition] to playing human-[vs]-human games”. I take no issue with someone playing a weak bot, I do take issue with the idea that it could “support” new players. Here's an analogy, because everyone loves analogies. Suppose Bob tells me the following: "Hey, there's a lot of people running around on an empty stomach. I hear that many people with an empty stomach like to frequent McD. I would like to support those people in their quest to fill their stomachs so I thought of opening a McD joint." I would tell Bob that his good intentions are admirable, but that there’s a moral choice involved. McD food has a tendency to make people sick, as opposed to keeping them healthy (which is what food should do). Now. Is the focus of your endeavour going to be to let people fill their stomachs, even if it’s garbage they’re filling it with? If so, go right ahead. I’m just trying to get you to make an informed choice.